Update: Brian Sumner has been switched to a different prosecutor. 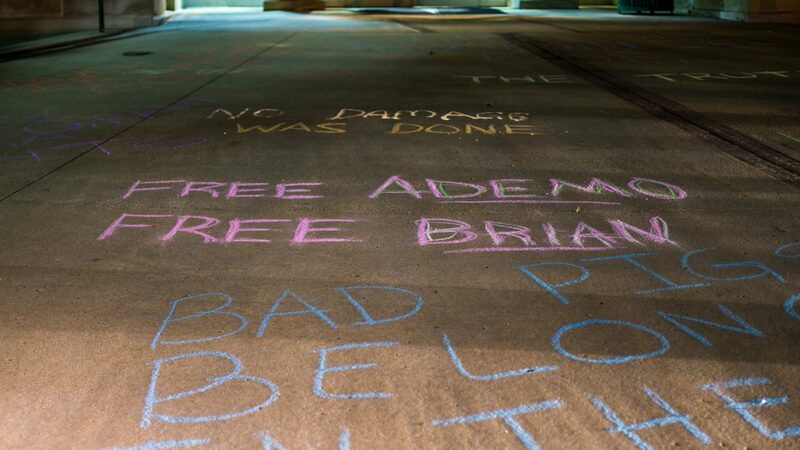 As you’ve undoubtedly heard by now, Ademo Freeman and Brian Sumner were arrested Monday in Noblesville, Indiana on outstanding warrants that had been issued as a result of a chalk protest they conducted there last month. Prior to that, they had been taking part in the Mobile Accountability for Cops Tour in order to bring attention to issues concerning the lack of accountability for police and to connect with various Cop Block chapters across the country. The chalk protest in Noblesville was part of the first stop on that tour. During the stop in Kansas City, Ademo was arrested for a “criminal mischief” warrant that was originally stated to be a felony, but in reality was a misdemeanor. This warrant stemmed from the protest in Noblesville and, apparently, based on the use of “liquid chalk,” which like any other sidewalk chalk is also completely washable and easily removed with nothing but water. It was shortly after revealed that Brian also had a warrant for the same charge. Ademo and Brian have asked that people contact the officials in Noblesville that have decided to attempt to prosecute peaceful protesters for something that has already been ruled legal and constitutionally protected under the First Amendment as Free Speech several times in the past. Sidewalk chalk, as the name would obviously indicate, is a common product designed, marketed, and used on a regular basis to draw on sidewalks. It’s an incredible rarity for anyone to be arrested or even cited for doing so on public property, which sidewalks unarguably are. 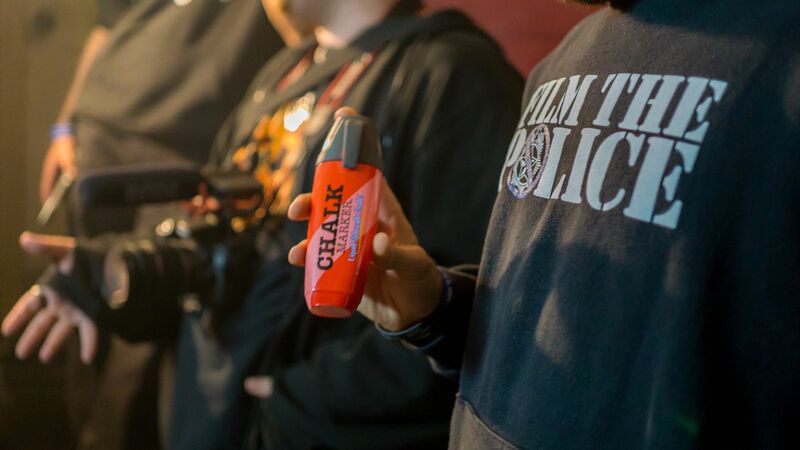 Almost exclusively, those few arrests have been the result of chalk being used as part of a protest and, once again almost exclusively, those cases have been thrown out or defeated in court. It amounts to nothing short of intimidation and a retaliatory act. Please contact James Baldwin, the prsecutor in their case or if you are in the area (and you really want to let them know you disapprove), visit the Noblesville Police Department and exercise your first amendment right with some chalk. Let them know that they shouldn’t trying to intimidate and retaliate against citizens for exercising their constitutional rights to protest against government abuses and injustices. There will be a chalking protest event held the morning of December 8th (the day of their next court date) starting at 7am at the police station, court house, and well the entire town. Facebook Link(s) – Noblesville Police Department – Noblesville Police Dept. It’s an indisputable fact that sidewalk chalk (liquid or otherwise) causes no material damage and can easily be cleaned with a regular garden hose or typical water bucket. Like in previous cases, the charges filed against Ademo and Brian were filed simply because the police and other authorities in Noblesville don’t like the fact that the messages being written criticized them and exposed the crimes that they are not held accountable for. Those messages could easily be cleaned up, even though the only real reason to have to do so is to try and hide what they say from those the police claim to “Serve and Protect.” However, the shame of the injustice and lies that the messages brought attention to cannot so easily be erased. #BlueLiesMatter and the #ThinBlueLies kill on both sides of that line.